Sorry, it's just now I got down to this! I have already used this pair of lenses last August, but a busy schedule just got in the way of me sitting down and giving this a review here. So here I go! Turquoise is one of those Freshlook shades that are meant to be vivid. I initially didn't like this one so much because there is this artificial feel to this shade in particular. Until I was able to use it long enough to see that it's sooo pretty in photos. Especially when you have brown hair and dark brown brows, this just makes your whole look pop. I am looking forward to similar shades being brought in by Freshlook (I think they have other vivid aqua green shades) because of this! As you can see, it's a vivid turquoise that stands out from a white background. And these are my eye shots with these lenses on. They're so pretty! They make your eyes look like an ocean in a good way. So yaaay, that's it for now. 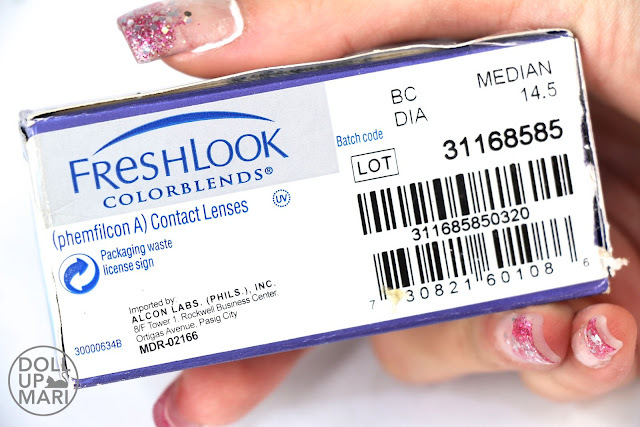 I have 3 Freshlook shades that I have yet to review!